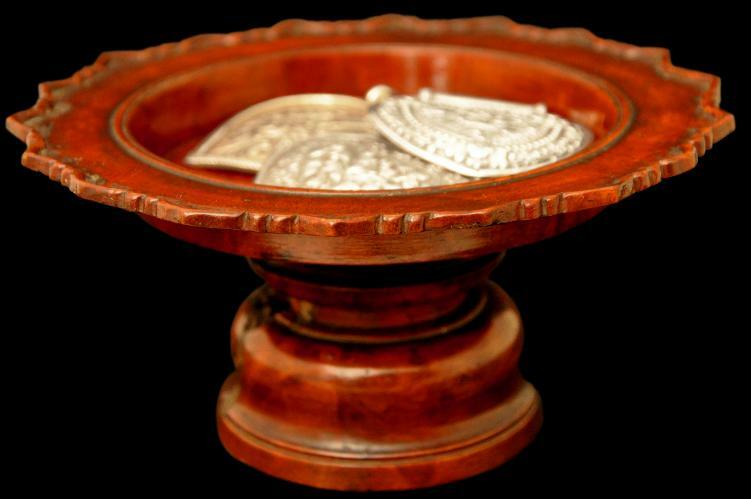 This beautiful Malay taza is carved from a single piece of rich red lustrous kemuning root wood. 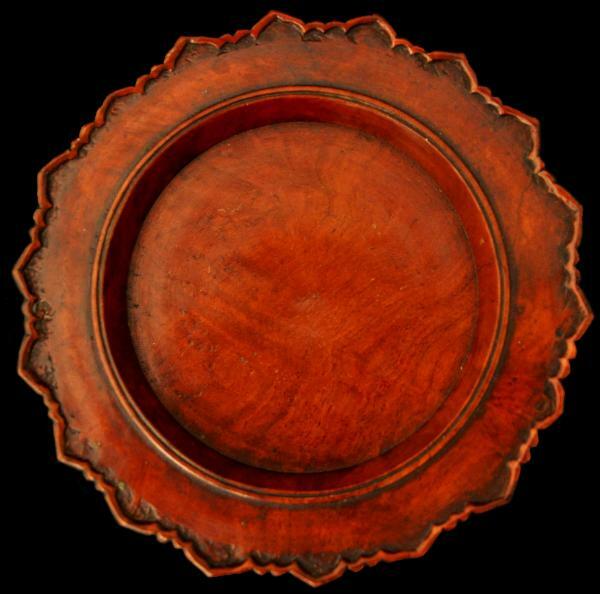 The shallow dish is surrounded by a scalloped rim that is edged with delicately carved raised border. 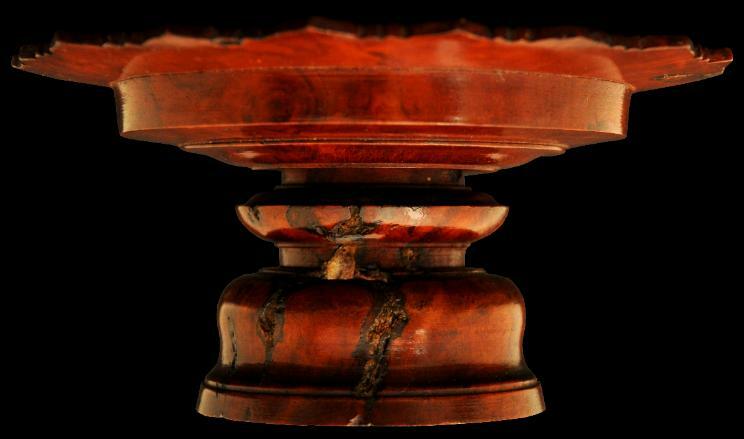 The turned pedestal is tiered with a gently splayed foot. Dark patches of grain leading to the occasional gap is symptomatic of the use of root wood. Tazas such as these were used in Malay households to raise food off the floor to hand level. Traditionally Malays ate with their hands sitting on the floor. 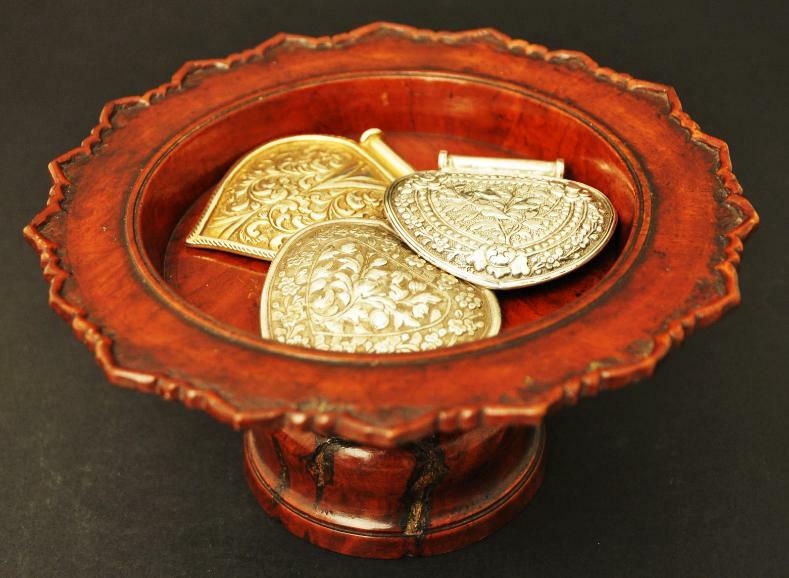 They were also used at weddings to display gifts. Pattani is a Muslim Malay-dominated state in southern Thailand which once was the seat of the Pattani Malay sultanate. 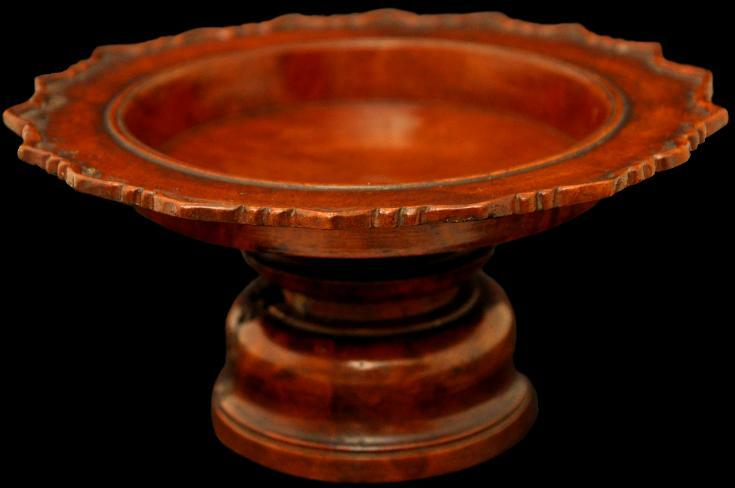 Kemuning wood (murraya paniculata), sometimes known as Chinese myrtle, is the most highly valued wood by Malay woodcarvers in southern Thailand and Malaysia. According to Noor & Khoo (2003, p. 32) the luminous, reddish colour of the wood is thought to particularly complement gold brocaded songket cloth and so, the wood often was employed to make keris handles and sheaths that are worn on the body close to songket. It was deemed to have a high spiritual quality (semangat), and was so highly prized that it was never used for construction or for items of furniture but was reserved for small, luxurious items. Wood from the root and lower part of the kemuning tree is most highly prized for its grain and colouration. This taza is highly decorative, and in a contemporary setting, provides and excellent receptacle in which to display small silver and gold items as in the image above.